How will children grow up when violence is an ever-present reality? An EA reflects on the affect on children from the non-violent protest of Kafr Qaddum, which frequently becomes violent – the Israeli army shoots tear gas and sound bombs at the protestors; protestors throw stones and burn tires. 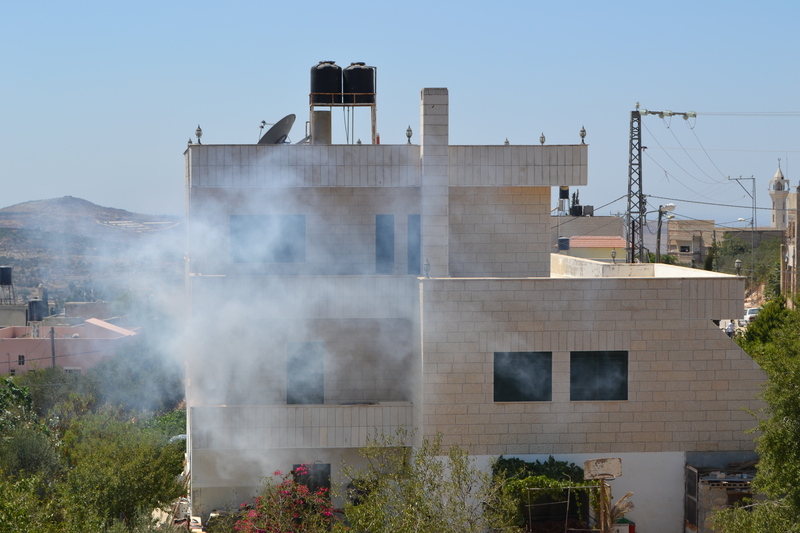 Tear gas surrounds the houses of Kafr Qaddum as the Israeli army often shoots towards the houses. Photo EAPPI/M. Soderstrom. The Israeli occupation of Palestine affects Palestinian society on many levels. 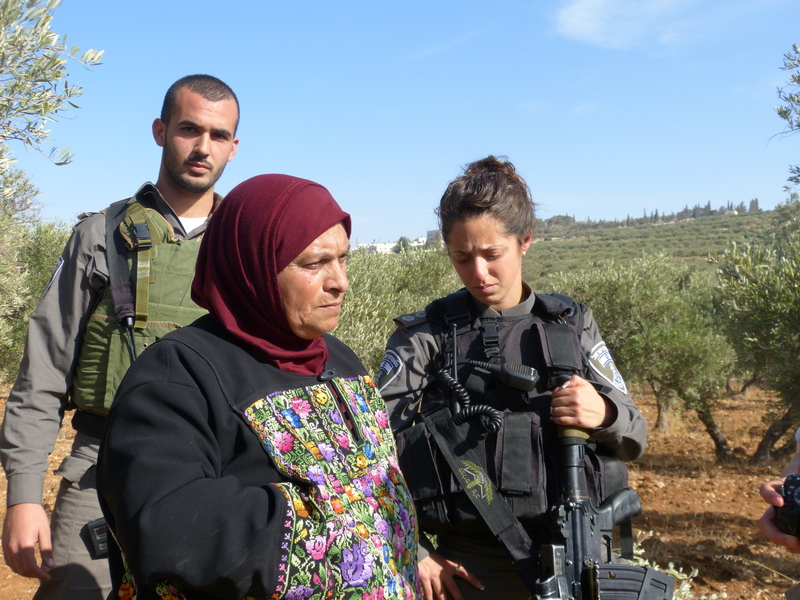 In the village of Kafr Qaddum, it is impossible not to be involved in some way. The village is known for hosting Palestine’s largest weekly demonstration and the whole village seems to be involved in the protest, in one way or another. Why do the people of Kafr Qaddum demonstrate? To understand why the demonstration takes place one has to know what lies in the surrounding area. Kafr Qaddum is located 15 km from the city of Nablus, where many of the inhabitants from the village work or study. Walking distance from the village lies the Israeli settlement Kedumin. On the webpage of Kedumin, one can read that the settlement hosts a high school specialized in boys with ADHD problems, a music academy and several women’s clubs. The settlement is expanding and currently there are 700 housing units under construction. Kedumin’s homepage, however, does not mention that the Israeli military has blocked the road between Kafr Qaddum and Nablus in order to protect the settlers. 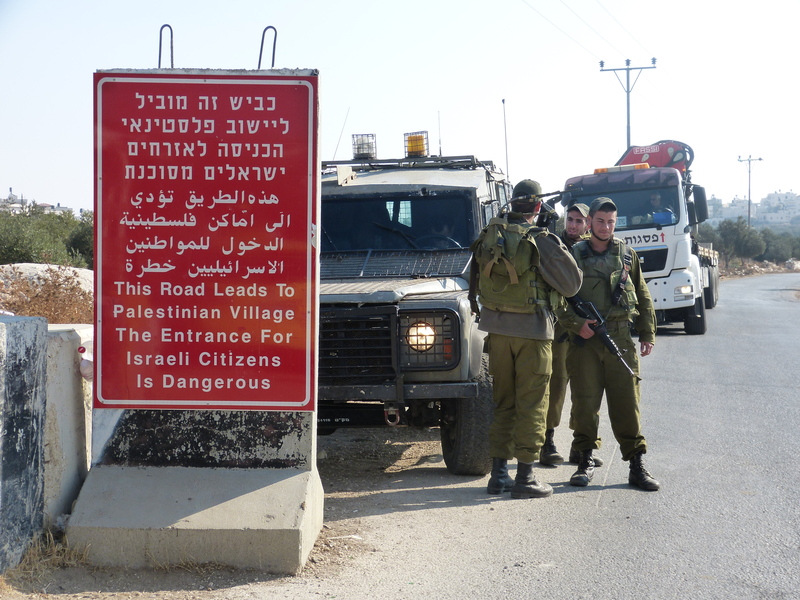 The roadblock forces Kafr Qaddum residents to take a detour and drive an additional 15 km in order to get to Nablus. Moreover, it does not mention that the settlement, through its mere existence, violates international humanitarian law, as the settlement is built on occupied Palestinian territory. The Israeli military is waiting as the residents of Kafr Qaddum approach the road block non-violently. Photo EAPPI/I. Lindwall. The Kafr Qaddum demonstration takes place every Friday, after prayers. According to its organizer, Murad, it aims to lift the road block to Nablus and prevent the settlement from expanding. The demonstration strives to be nonviolent. “That’s why we let our children participate,” states Murad. Despite this, the demonstration tends to become very violent – tear gas and sound bombs are shot at the protestors, stones are thrown by the protesters, tires are burnt, and people are arrested. “Last Friday was like a war,” says Buker, one of the sons in the family whose house is the closest to the settlement. He tells us that the feathers of the family’s geese have turned black because of the smoke resulting from the protests every Friday. Sometimes his family is too afraid to stay in the house when the demonstration is about to take place. They fear not only the tear gas, but that their house will be occupied by the Israeli army (which has happened on several occasions in the past). I asked Murad if the purpose of the demonstration can get lost amidst the tear gas. He answers that this is not the case: “The whole village is proud of our resistance”. On Friday, 16 November 2013, four boys aged 8-10 years-old were playing outside one of the houses closest to the settlement. It was around 9.30 am, three hours before the demonstration would start. 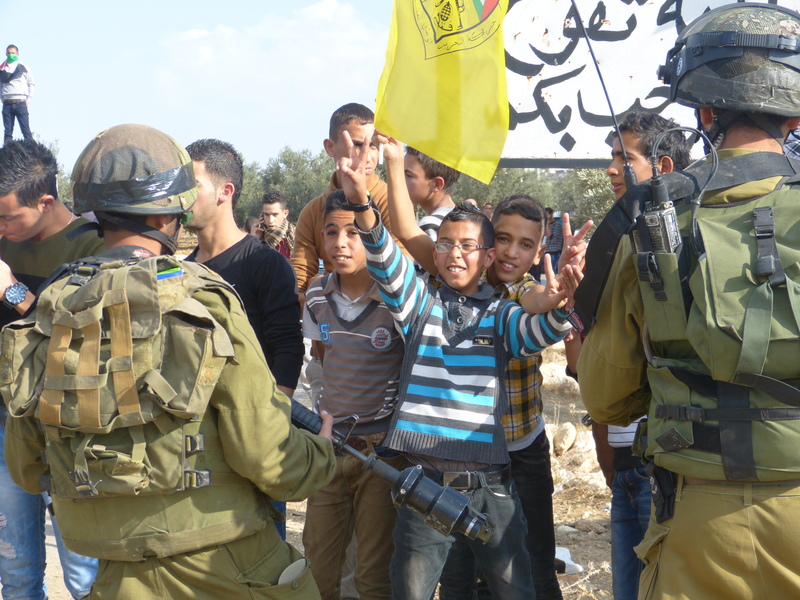 Different people have different versions about what happened that day, but it seems clear that the children were detained and handcuffed for one hour by the Israeli military and asked whether they would be participating in the demonstration. During this detention, a neighbour heard the children cry and tried unsuccessfully to convince the soldiers to release the children. The neighbour then called the Palestinian authorities, and after negotiations with Israeli authorities the children were released. 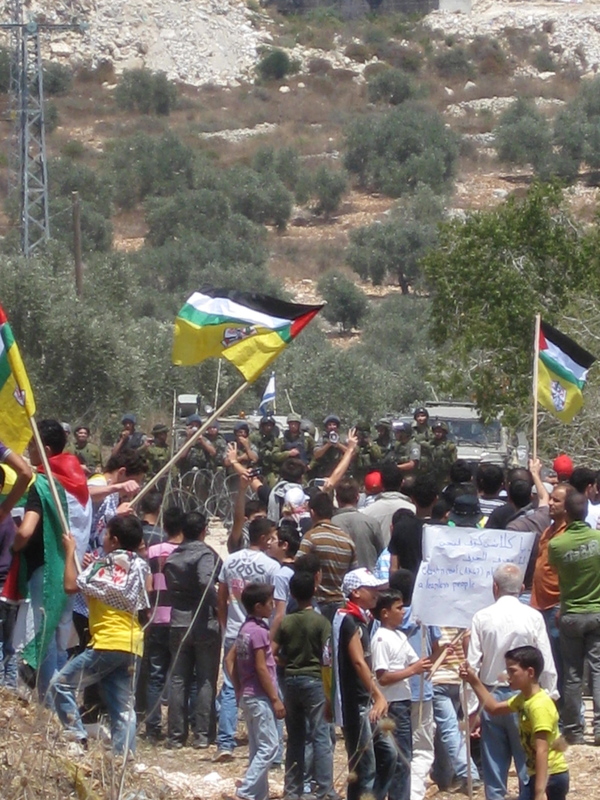 The demonstration that followed was very violent, even by Kafr Qaddum standards. About 14 people were injured and arrested.The Mayor of Kafr Qaddum stated that hundreds of tear gas canisters were found on the ground after everything ended. Several people from the village speculated that the demonstration was unusually violent since it coincided with Palestine’s national day. In June 2013, the Israeli army shot a tear gas canistar into a Palestinian house in Kafr Qaddum with 6 children. Photo EAPPI/B. Myszkowski. A few days after the demonstration took place I had the chance to speak with one of the boys that was detained. Hussam, 8 years-old, said that he wasn’t afraid during the detention. He did not have any problems sleeping afterwards, so why would he be afraid? Yes, he and his friends discussed the detention in school but none of the boys admitted that they were scared. 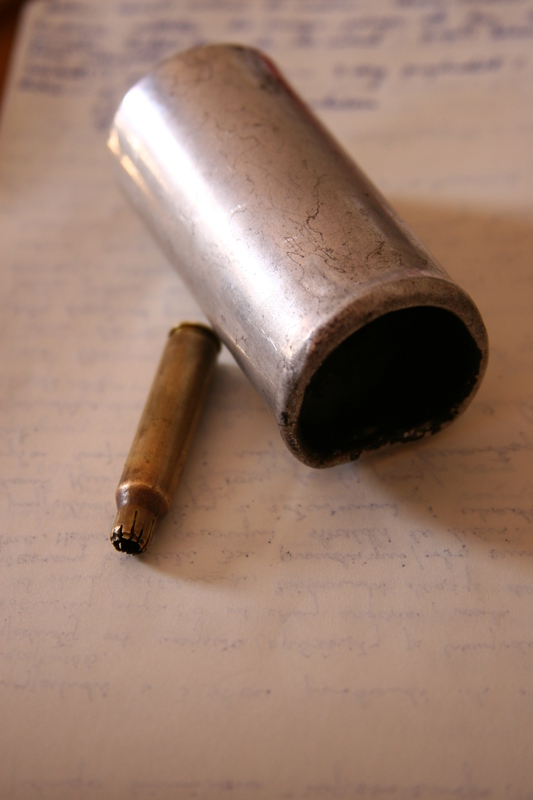 He then showed the bruises on his arm that he claimed was a result of one of the soldiers grabbing him. When I asked how it felt to talk about what happened, he replied, “I am proud”. As a response to this, one of the men in the room gave him a manly pat on the back and laughed. I felt that I had to look away, close my eyes and take a deep breath to try and have a neutral reaction. Resistance, but a what cost? I reflect on the negative aspects this culture of masculinity fostered by the occupation, where violence is constantly present. I think about how this eight year old boy is being introduced into a romance of violence that he may be too young to fully understand. How Hussam, despite his young age, is now ‘one of the guys’ and what he has been through might be the first of many detentions and violations of human rights that he will experience. I think about the attention this boy received as a consequence of being detained, attention received even from people like myself. This may have been the first time he has spoken to a foreigner. Probably is. I also consider the alternatives that the people of Kafr Qaddum have. They want to express their discontent; they want to prevent further expansion of the settlement, they want to change their situation. As the settlements are already considered legal by the occupying power, the legal system seems to offer little help. Every Friday the people of Kafr Qaddum show their resistance. But at what cost? Alternatively, what is the price of refraining from demonstrating? If you live in Kafr Qaddum you cannot choose to ignore the politics surrounding you. Most Palestinians do not have that luxury: they are drenched in the politics of the occupation.